Lean closer. Listen. The city hums. The occasional motorcycle from the new spring crop rumbles by. The furnace hums. Purple finches squabble over bird seed at the feeders. Cars pass. Maddy, the dog, twitches and whimpers in her dreams on the sofa. Railway locomotive diesels throb through the coulee. Life goes on around me. Most people are enjoying a holiday. 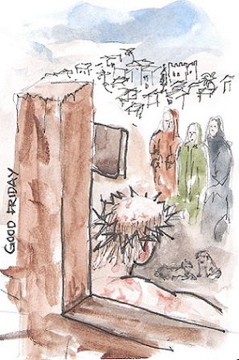 Most are oblivious to what we Jesus followers are up to on Good Friday just as they must have been in Jerusalem when Jesus drank the cheap sour wine, said "It is finished" and gave up his spirit. Life went on all around as "he poured himself out to death" (Isa 53:12); so many oblivious, then and now, to the final fight to the death for their souls and ours. Lean even closer. Listen. Nothing seems to have changed. I don't feel the anguish that Jesus felt. My life is not in danger. I can't crank the feelings up at will. But that's not the point. It really is finished. The point is to listen to the words of Holy Scripture, and to remember and to honour Him for—to give him worth for who He is and what He completed. I remember at an Evangelical Association city wide Good Friday service a few years ago, now retired Pastor Mark Bolender called what Jesus did, "majestic submission." When I lean close and bow, my all too frail, willful and sinful humanity is brought into distressing relief when compared to His majestic innocence and submission. My heart cannot but glow in the face of such knowledge.